Most of us are not immune to Cellulite. 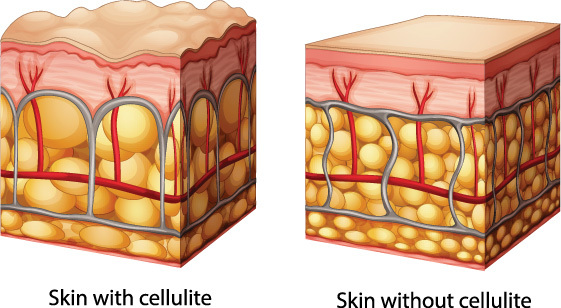 Cellulite affects most women and also some Men. Hormones have a huge influence over Cellulite and as women's hormone levels change and oestrogen decreases, we typically see more and more dimples, waves and cellulite. Science is now learning more and more about fascia and it's role in many aspects of electricity transfer, moisture absorption and its ability to block absorption, how hormones affect its texture and response and its role in pain and bodily structure. So what does that have to do with Cellulite? Well, fascia is the web matrix that determines our shape, how much moisture is allowed to enter our tissue, and also can strangulate tissue holding cellulite in places we don't want it. Massage Cupping has become accepted in many Nations across the globe as the easiest and most effective way to treat cellulite by utilizing a reverse massage negative pressure technique. 1. Start with the ﻿Classic small body cup, supreme medium﻿ softer cup or if you are using the plastic cups with pump gun, make sure you use low suction to start. 2. For best results, perform this procedure in the shower after you have lathered up with soap or body wash. (preferably a product using natural ingredients with no sulfates, parabens, petrochemicals, triclosan or other harsh chemicals). If performing outside the shower, then you will need to apply oil or cream to your skin in the area where you are working prior to cupping for lubrication and easier glide. 3. In the case of saddlebags and or cellulite below the hips, you will want to apply the cups on the outer area of the hips and gently slide the cup towards the inguinal lymph nodes located on each side of the groin as pictured below. It is important to move all the lymph and fluid towards these lymph nodes with each glide. first take the cups, suction to the skin and glide over the hips and buttocks in an upward motion, coming across the hips to the front to open the pathways to the lymph glands. Once you do this several times, you can then work on the cellulite areas making sure that whatever direction or motions you slide the cup around, you always finish by long sliding strokes upwards to the hips and then over around to the front to guide it to the lymph glands. 4. As the tissue softens, begin gliding at a faster speed than you started with but continuing to drain towards your inguinal lymph nodes. You will begin to feel heat in the area you are working on. This is great! This helps to soften the tissues making it more pliable and easier to work with. It also helps with the lymph drainage and fascia molding in the area. Continue gliding. Your work and the magic really begins to pay off once the tissue becomes warm. Before that, you are really just preparing for the treatment. In professional sessions, the therapist really doesn't consider therapy beginning until after the tissue is warm. They will work really briskly sometimes to help speed up the time to get to the warmth..
4. As the tissue continues to softens, you can begin using a larger cup. When switching to a larger cup, you will need to slow down again as the larger cup will have a little stronger suction and you will begin working deeper than you began with. As this tissue softens and gliding becomes easier, then you can increase your speed again creating more heat in the tissue. You do not have to change the size of cups, but if you have a set with multiple sizes, remember the larger cups typically go deeper. Don't try to rush it though, if you are using strong suction or large cup and brisk motions, you will not get as good of results if it's uncomfortable. If you only have large cups, then use less suction and glide slower until you reach the warmth and the tissue softens. Love my cups! Cellulite is fading away. Now I’ll try this on my face and tummy.